The Trim-A-Brake II™ by Van Mark is a portable bending brake with durability and versatility second to none. Ideal for custom forming aluminum, galvanized steel, copper, terne and other metals - coil or sheet. The Trim-A-Brake II™ bends .032 aluminum and 28 gage galvanized steel with ease. The Trim-A-Brake II™ features a toggle locking system with single point adjustment for worry free, low-maintenance operation. The Trim-A-Brake II by Van Mark is a portable bending brake with durability and versatility second to none. Ideal for custom forming aluminum, galvanized steel, copper, terne and other metals - coil or sheet. The Trim-A-Brake II bends .032 aluminum and 28 gage galvanized steel with ease. The Trim-A-Brake II features a toggle locking system with single point adjustment for worry free, low-maintenance operation. Contact your Van Mark distributor today and see how economical Van Mark quality can be. All your projects may not be this tough, but when they are, rest assured the Trim-A-Brake II will meet the challenge head on. Years of dedication and commitment to improving performance have gone into the Trim-A-Brake II resulting in a brake you can take to your job knowing it will deliver and that is one less worry for you. Whether you’re a seasoned pro, or just starting out, you'll appreciate Trim-A-Brake II for its simplistic and durable design. SCORING POCKET -Eliminates scratching of hinge surface. 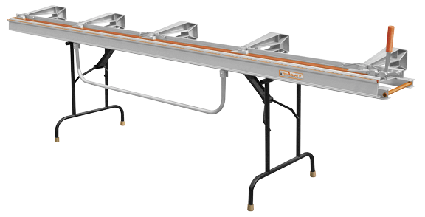 I-BEAM BASE RAIL -Rigid base ensures precision bends along entire brake length. FULL LOOP HANDLE -Detachable and easy to grab, ensures even bends each time. VINYL CUSHION STRIP -Protects painted coil stock. "Trim-A-Brake II" has been there to help launch many successful siding careers"
The Trim-A-Brake II by Van Mark Products Corp. is a portable metal forming tool that offers durability and versatility second to none. It is ideal for custom forming aluminum, galvanized steel grade D and E, copper, terne, and other metals, coil or sheet. It is rugged and durable, with bending capacities of .032 (3003 H14), aluminum and 28 gage galvanized steel up to 12' in length. With our toggle-lock system and single point locking adjusting, the Trim-A-Brake II requires little maintenance. 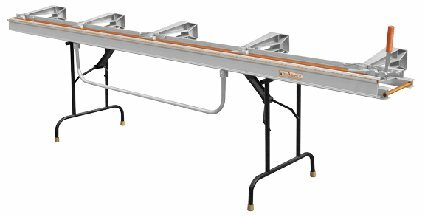 Van Mark also manufactures a complete line of the finest quality tools and accessories for the home improvement industry, including the Mark I & II Brake, Trim-A-Table, Trim-A-Slitter,Trim-A-Gutter & Coil Dispenser. Contractor Duty - Metals come in a wider variety of alloys and tempers that can greatly affect bending capacities. Please contact us for current recommendations on specific metals.